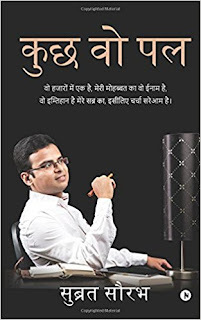 Kuch Wo Pal is a collection of Hindi poems by the debut author Subrat Saurabh. The author is an Engineer and works with an MNC in Bangalore. I can very much relate to him being an Engineer working in Bangalore. He is very popular on twitter and facebook. Thanks to Blogadda for sending across a review copy of this book. This is a 75 page book which can be finished in one go. However, reading a collection of poems is unlike reading fiction. When you read fiction, once you finish it, you have no fixation to read it again. This book, demands reading it over and over to understand the essence of it. Every time you browse through the pages of this book, you get to dive deep into the ecstatic world of words woven so beautifully. It is like a web from which you would deny to escape. The poems are mostly about the author's experiences of staying away from home and working in a distant city and some exhibiting a broken heart's pain. All of these are penned in contemporary style of writing. One good part is that none of these seem to be inspired by any other poet's work, they are all afresh. The poems are all composed in different writing styles. I especially liked the ones that are based on nostalgia, the ones that depict the pain of being away from home and family, the remembrance of childhood and the fragrance of memories of one's native place. One thing that I expected from this book is something more than a lover's pain and sadness. The poems could have been set in vivid moods. Although, every poet has a genre, a way of writing and thinking. However, I am anticipating all this in the subsequent books from the author. I underlined a few lines from many poems, which I liked very much and read again and again. I was willing to add them to this post but that would have been a spoiler :) Hence, I refrained from doing that! The shayari at the end is like cherry on the cake, quite mesmerizing. 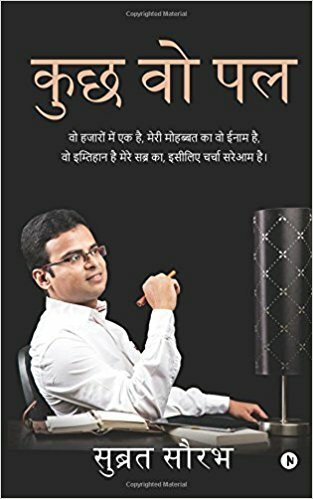 I myself am fond of reading and writing poems, and hence, can sense the immense efforts put on to write what is apparently a thin book. In the world where you have easy access to poems and prose online, it is a endearing experience to hold one such book. These days, when you can easily type in your thoughts on the web, it is hard to find one such collection as a book. You cannot replace the feel of holding a book over any other digital media. Overall its a quick read, recommended for those who understand and admire poetry rather than SMS and Whatsapp jokes. Those who are into writing poems can also get a lot of inspiration from this collection. I rate this book 3.5 on 5.